Love it or hate it, Pokemon Go is everywhere. If you hate it, then you're probably not reading this. You also don't care how to take better pictures within the game. But, if you're like over 65 million other people, then you're trying to catch 'em all. I love the camera feature in the game. It's the perfect tool for showing off their Augmented Reality success, and for the players to share everywhere. Its a perfect app viral mechanism. 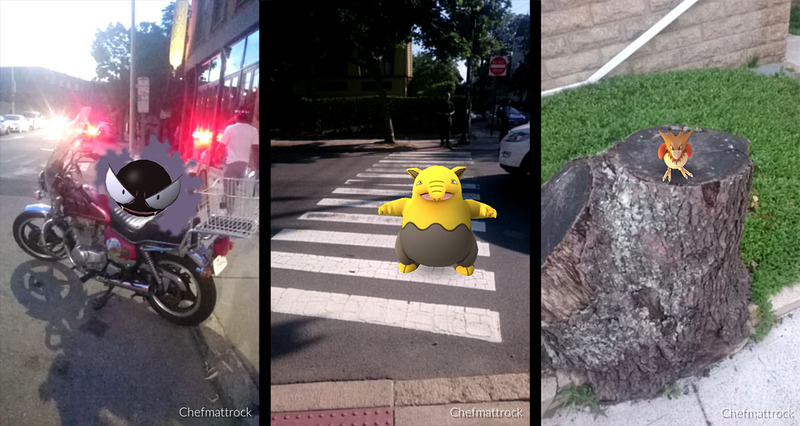 This whole post is about pokemon inserted into your real surroundings. If Augmented Reality mode is off, then your Pokemon is just on an animated green background. Boring. Once a pokemon pops up, and you touch it to catch it, check the top right of your screen. There's a little A/R toggle switch. Do you see the area you're in? Good. Lets continue. Not just for safety, but also for scene ideas. You have to think like a street photographer. While you're waiting for a pokemon to pop up, constantly scan your surroundings. Look for unique features around you. Motorcycles, stumps, trash, chairs, lawn ornements. Any of these items can help to set the scene of your picture. Don't spend too much effort trying to force a scene that isn't going to work. For example. A crab doesn't really work on powerlines. It's just weird. Your immediate instinct is to start tossing pokeballs like mad because you don't want it to escape. Take a breath, and wait a sec. Turn on the camera mode by tapping the camera icon. That removes the pokeball from the bottom center of the screen. The familiar camera shutter button replaces the pokeball. On the left is the button to return to the catching screen. While in camera mode, you have time. Look around you and start composing your scene. Find a garbage can for the Rattata to guard. Maybe the Gastly finds a black motorcycle to loom over. 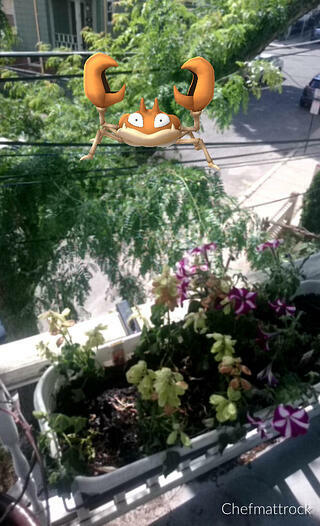 I hear Jigglypuff likes to bounce around in the flowers on peoples front lawn or hanging baskets. Think about how you can use what's around you to compose an interesting frame. Once the catching screen loads, the app locks in the compass direction of the pokemon. You can tilt around your camera to place them relative to objects that make sense. They do a pretty good job of adding the image to a live shot. But, it still takes a human to add interest to the scene. Pro Tip: Toggle AR mode to change direction. 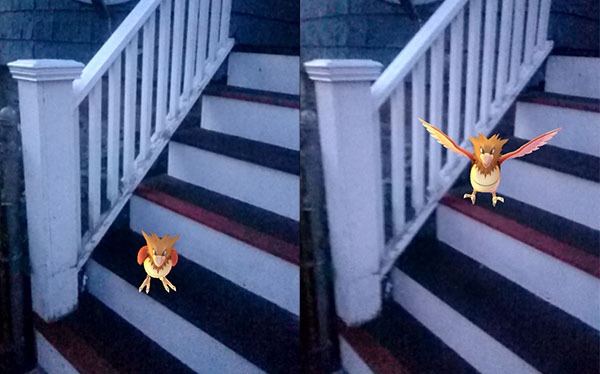 It is possible to change where the pokemon is relative to you. If your pokemon is stuck on the south side of you, and you want it on the north side, there's a solution. Open up the camera again. That allows you to reposition and reframe. This game is so exciting you always feel under pressure to catch the pokemon. Remember that you can relax and reframe. Often the best picture isn't the first one you take. Pokemon don't sit still. When you start camera mode, they sit peacefully for 10-15 seconds. Most people will take a picture of them at rest, just sitting there. If you want your shots to stand out, wait for them to jump, flap, poke, attack, swipe or whatever it is that they do. Each Pokemon has a different attack movement. They will 'attack' towards you, even in camera mode, so you just have to wait for it. Always look for something to make your photos stand out from the rest. This is an easy one, it just takes a little patience. Show your creativity here. You can't pick what kind of Pokemon you're catching, but you an choose where to snap the shot. Make the most of what's around you. Think about how you can tell a little story with this picture. Is that Slowpoke eating your dumplings? Can you catch a Jynx dancing the Hula next to your pulled pork? How about a Shellder on some crushed ice next to your oysters? I think putting a Gastly on a motorcycle is funny. Especially if you happen to catch some tail lights in the reflection of a window, and turn them into evil eyes. Drowseys are sleeping all over my neighborhood. So I decided one should get hit by a car in a crosswalk. This Spearrow seemed sad sitting on the stump of an old tree. Know where to catch a Persian? What is your favorite pokemon shot? Share them and tag me!